We conducted our first Psychodrama Training on April 9th, 2016 at Faculty of Psychology, Universitas Indonesia. 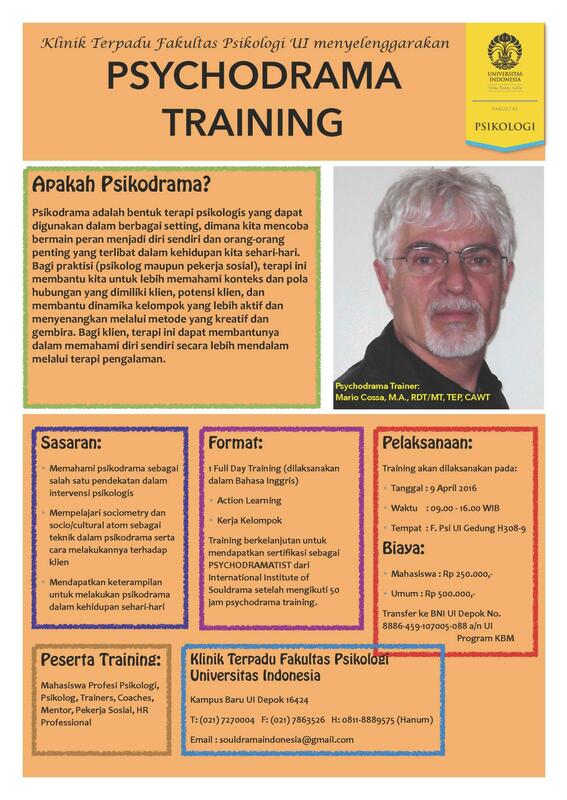 This training aims to facilitate you learn about psychodrama, group psychotherapy, sociometry and souldrama. We are planning to conduct the training annually for 10 sessions. practice psychodramatic techniques, such as: role reversal, doubling, future projection, mirroring, magic shop, and many more. 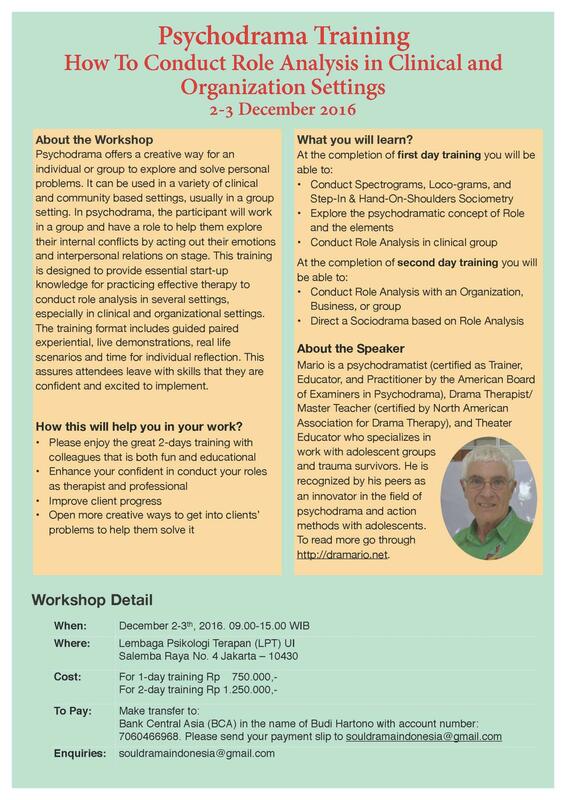 work towards becoming a Certified Practitioner of Psychodrama, Sociodrama, and Group Psychotherapy (if desired). The protagonist: Person(s) selected to "represent theme" of group in the drama. The director: The trained psychodramatist who guides participants through each phase of the session. . Psychodrama affords participants a safe, supportive environment in which to practice new and more effective roles and behaviors. J. L. Moreno investigated the structure of groups and society and developed Sociometry-the scientific measurement of social relationships in groups. As in systems models, the individual is viewed in relationship to others. Sociometry in its most basic sense can be best characterized as a collection of methods to investigate and evaluate networks of existing and preferred relationships. Specifically, sociometry is the study of interpersonal choices regarding criteria of interest to the investigator. Sociometry is not a study of formal group structure (e.g., official hierarchies); rather it is a phenomenological study of people's interpersonal choices (Treadwell & Kumar, 1985, 1997). Sociometric explorations measure, observe, and intervene in the natural attraction/rejection processes within a given group, e.g., family, social, work, community. These explorations may be didactic or action oriented and include social atoms, role diagrams, interpersonal relations, sociograms, and social networks. Facilitate constructive change in individuals and groups. Increase awareness, empathy, reciprocity and social interactions. Explore social choice patterns and reduce conflicts. Clarify roles, interpersonal relations, and values. Reveal overt and covert group dynamics. Increase group cohesion and productivity.